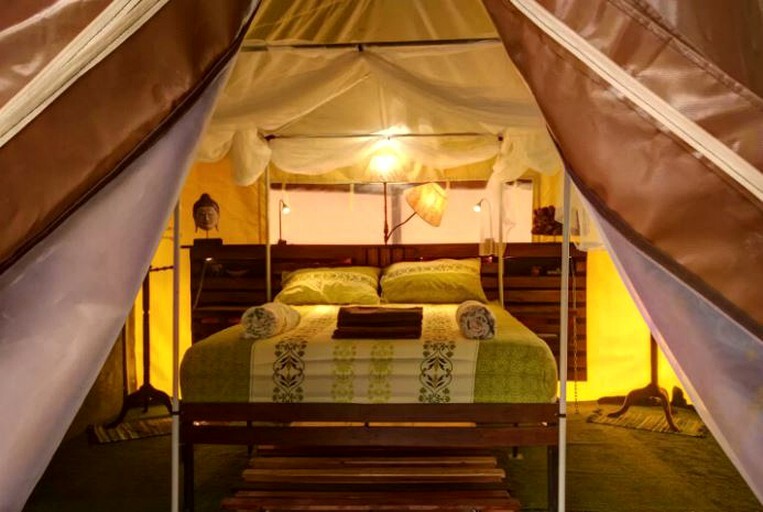 This luxury camping tent is located in a nature park near Patong Beach, Thailand, and can accommodate up to three adults or two adults and three children for a relaxing getaway to a peaceful, unspoiled, and flora-filled setting in the center of Phuket Island. 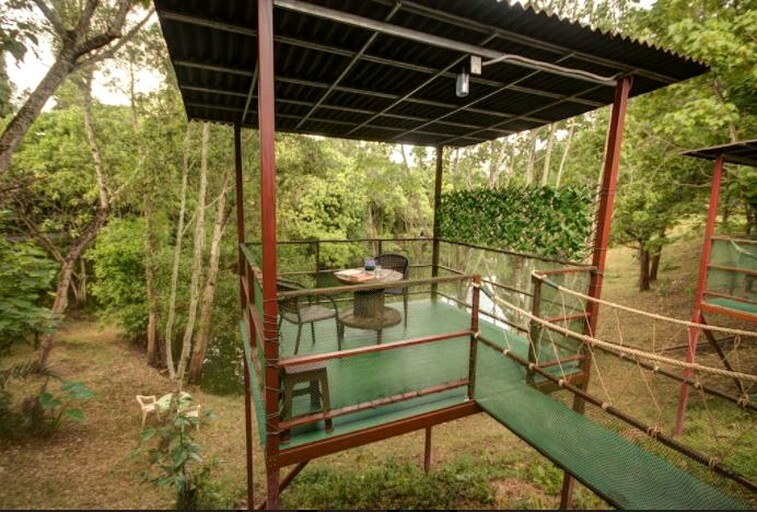 From its elevated position on the banks of the Baan Mae Ying Lake, where it is surrounded by lush, tropical vegetation, the tent provides guests with an opportunity to enjoy all of the amenities of a resort while also experiencing the natural joys of camping—or in other words, glamping at its best. 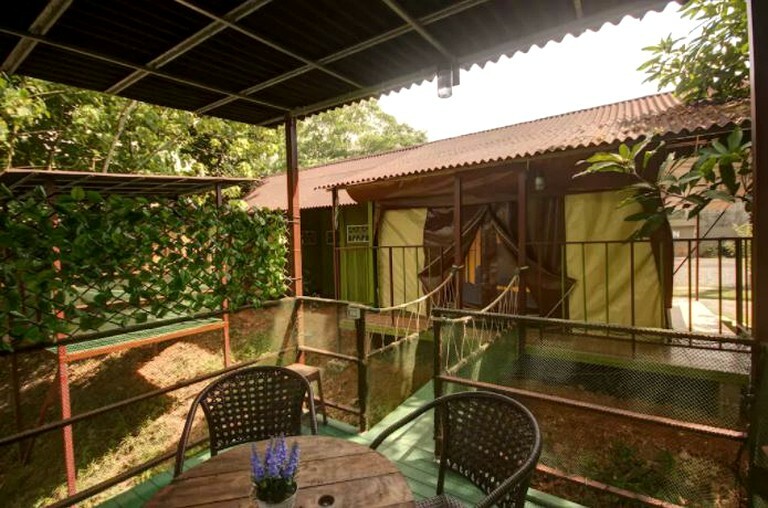 The tent comes with one bedroom, one full ensuite bathroom, and a separate terrace overlooking the lake, along with access to all of the shared facilities of the resort to which it belongs. 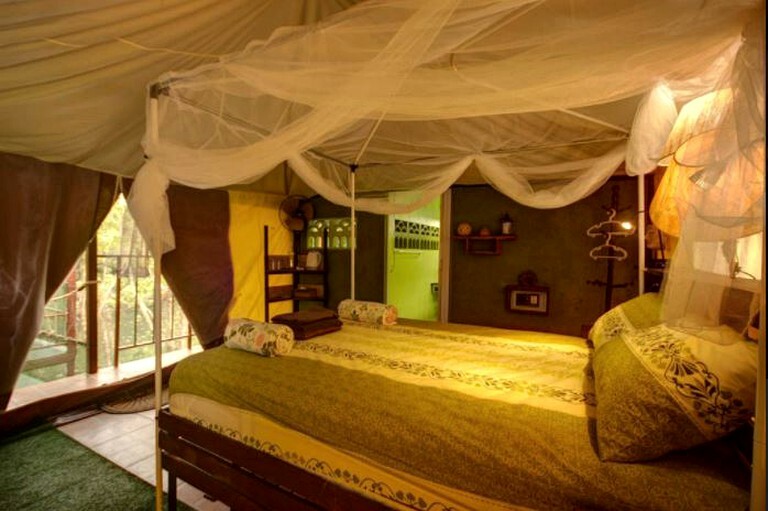 Featuring custom-made furniture built on-site out of recycled materials, the bedroom of the tent is furnished with a queen-size bed with a comfortable mattress, reading lamps, bedside shelves, a bookshelf, a clothing rack, a writing desk, and a side-mounted fan. In the bathroom, guests will find a toilet, a sink, a mirror, and a shower with hot water. Linens and towels are provided. On the terrace, which is accessed by a small bridge, guests will find a table with two chairs—the perfect place to enjoy a snack, a conversation, or a book while also savoring the views of the lake and its natural surroundings. 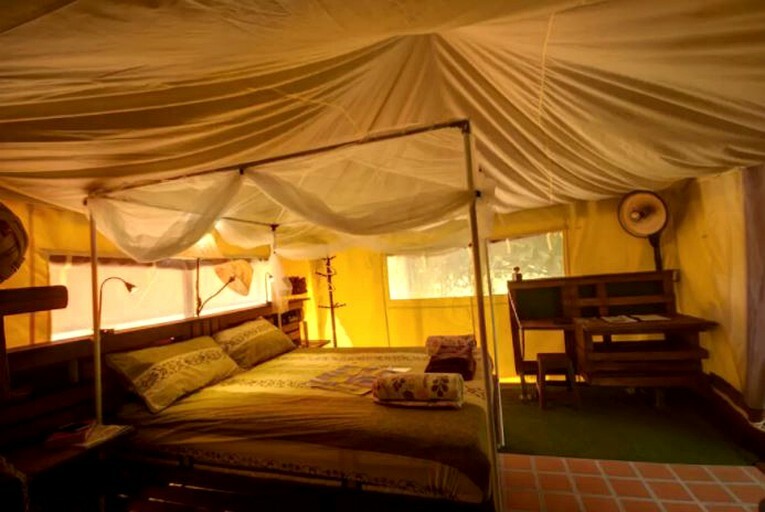 Other amenities include complimentary Wi-Fi, a cooler box, a mosquito net, a hot water dispenser with tea and coffee, and a double roofing system that helps shield the tent from the sun, improve its ventilation, and keep its internal climate comfortable even during the hot season. 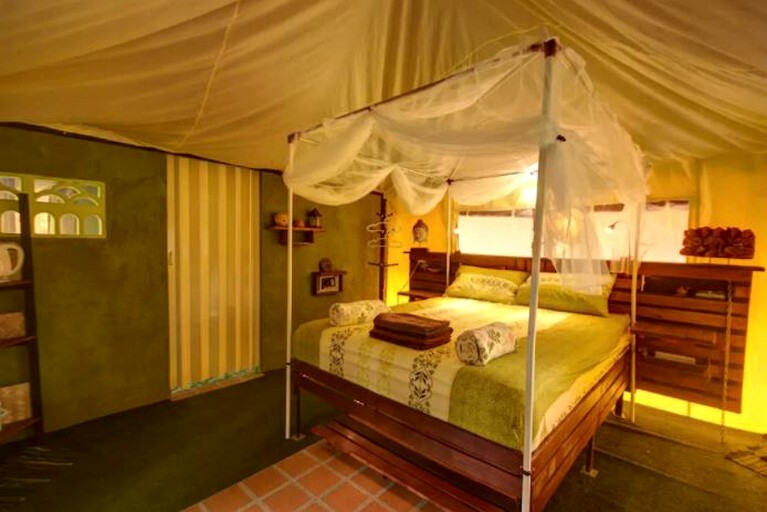 The bedroom of the tent can accommodate two adults and one child under the age of six (all sharing the same bed) or two adults in the queen-size bed and one older child in an extra bed, while an additional tent can be set up on the terrace to create another sleeping space, which can accommodate one more adult or two more children. A cot is also available for infants. Full refund. If the guest cancels 24 hours or more prior to check in. Those arriving by car will find plenty of free parking right on the premises. Guests will enjoy an outdoor swimming pool, which is open year-round, along with a terrace featuring patio furniture and parasols, and a Thai sauna. The property has its own bar, where guests can purchase refreshments, and glampers have breakfast included with their accommodation and will enjoy a continental-style morning meal here. Guests who wish to arrange car or bike hire, book a day trip, or have any other queries, can make use of the property's concierge service. A game room is available, featuring books, a ping pong table, and a pool table, and there is also a common lounge, with a television. Glampers will be able to prepare their own meals using the property's shared kitchen, which has all of the appliances and utensils guests will need, including a fridge, in which they can keep food fresh. Guests also have the use of a self-service bar for making drinks. Those who need to stay connected can take advantage of free Wi-Fi access, which is available in all areas of the property. For an additional charge, the host offers massage services, including head, foot, and neck massages. For an additional charge, the host can arrange Thai cookery classes, taught by experts. Guests should inquire with the host for more details and pricing. The property is located in the center of the island of Phuket, meaning that guests will not be too far from any of the fun activities available in the area. Those traveling with children might enjoy a trip to the Splash Jungle Water Park, which is home to 12 exhilarating water slides, with professional lifeguards on standby to make sure that visitors have a fun and safe time. Alternatively, glampers may like to make an evening visit to FantaSea, which is a Thai nighttime cultural theme park, featuring three main attractions, namely a Thai culture theatrical show, a themed buffet restaurant, and a shopping street. Guests who love the water will be able to take to the sea in many different ways, such as scuba diving and snorkeling, kayaking, kite surfing, paddle boarding, and jet skiing. There are many different types of boat trips available, including fishing excursions to catch tuna, marlin, barracuda, king mackerel, and more. 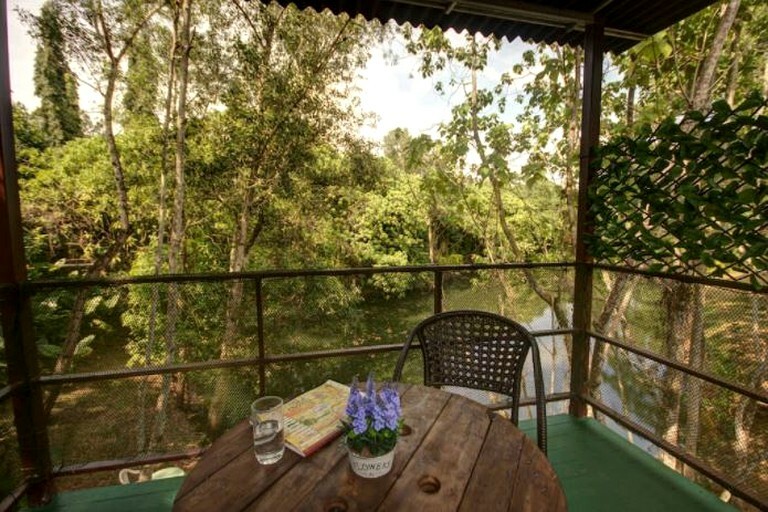 In the Khao Phra Thaeo Wildlife Sanctuary, which is only seven miles from the property, glampers will have the opportunity to see a tropical forest, stunning waterfalls, and local wildlife, which might include monkeys, gibbons, porcupines, deer, as well as an abundance of birdlife. The reserve has several forest trails, which are ideal for hiking. This region is extremely rich in culture and history, and there is no shortage of ways to learn about this fascinating country. Guests can visit the Phuket Heroines Monument, which tells the story of Lady Chan and Lady Mook, who led the locals to fight against Burmese intruders and won a battle more than two centuries ago. Glampers might also enjoy a trip to the Thalang National Museum, or the Kathu Mining Museum. There are many stunning temples to discover in the area, and the host will be able to advise glampers on the best places to see. One of the best features of Phuket is its amazing beaches. The island has more than 30 beaches, with a wide variety of atmospheres, scenery, facilities, and even textures of sand available. Kata Beach, around an hour from the property, is considered by many to be the best, with its soft sand, relaxed ambiance, and pristine waters. The beach offers great surfing, during the low season, and snorkeling during the high season. Those who don't want to make the hour's car ride will be pleased to know that there are plenty of beaches much closer to the property, with the gorgeous Surin Beach only seven miles away. You will receive a full refund if you cancel 24 hours or more prior to check-in. You will receive a full refund for the remaining nights and charged for one full nights stay if you cancel within 24 hours. Guests are allowed to smoke only in designated areas of the property. This property is not suitable for pets.